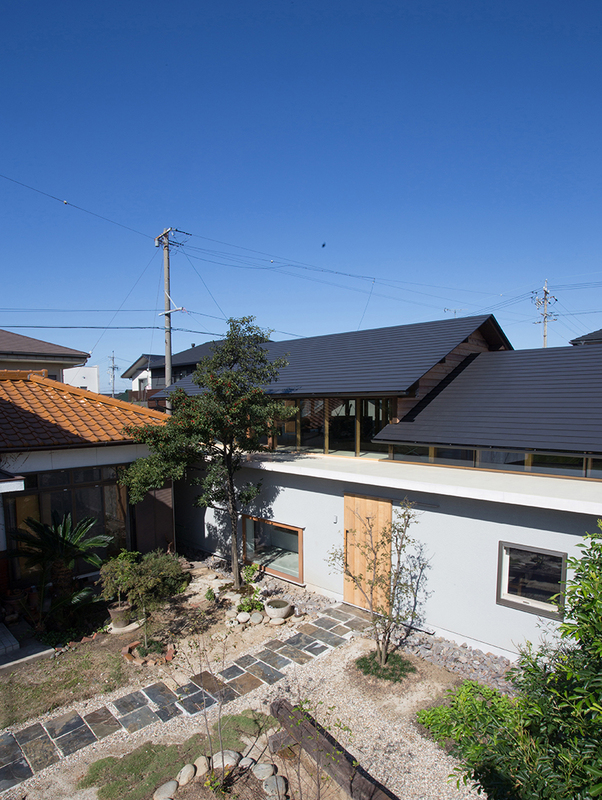 the site for 1-1 architects’ ‘house NI’ is set in a residential area located in the urbanization control area near nagoya city, japan. the clients are a married couple whom are reaching their retirement age and his mother who lived there for many years. 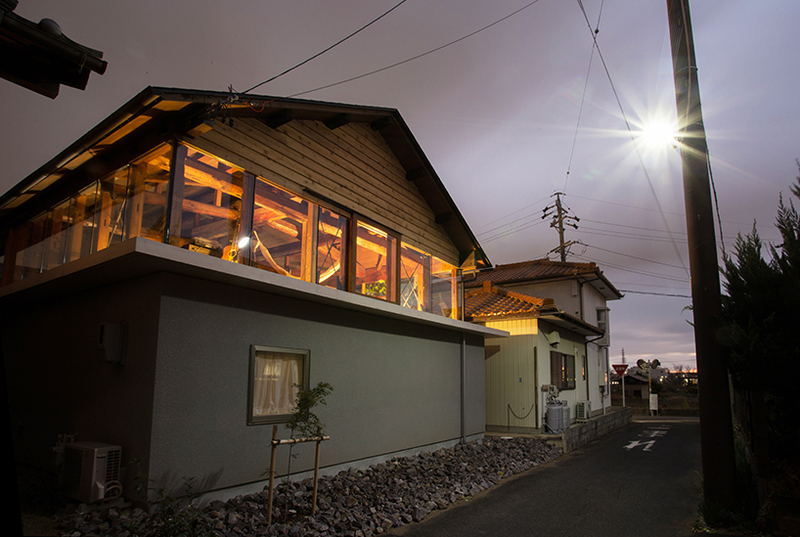 the 50-year-old wooden house where the owner lives at the time was built on the site. 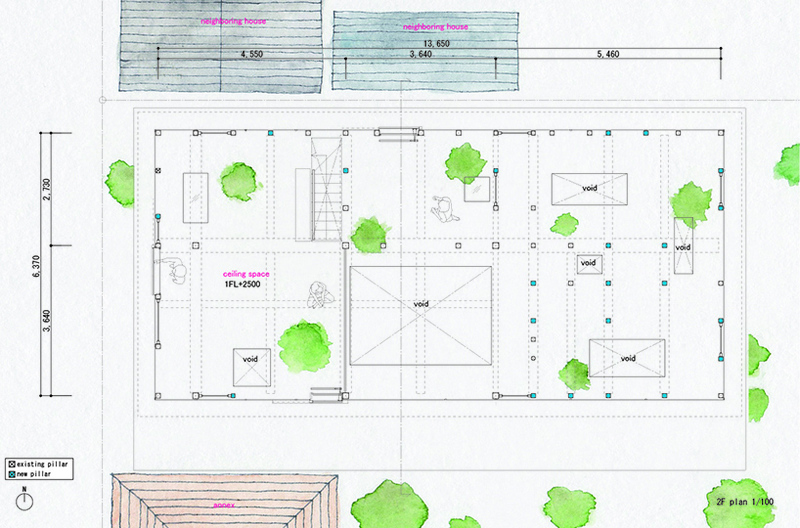 the requirements from them were to each have a private room and a large floor area beyond the current situation. 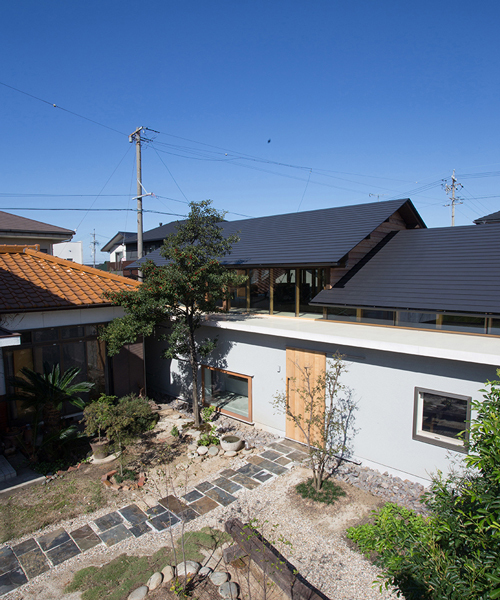 initially it was a rehabilitation request, but japanese based practice 1-1 architects felt a sense of incompatibility when investigating existing houses. 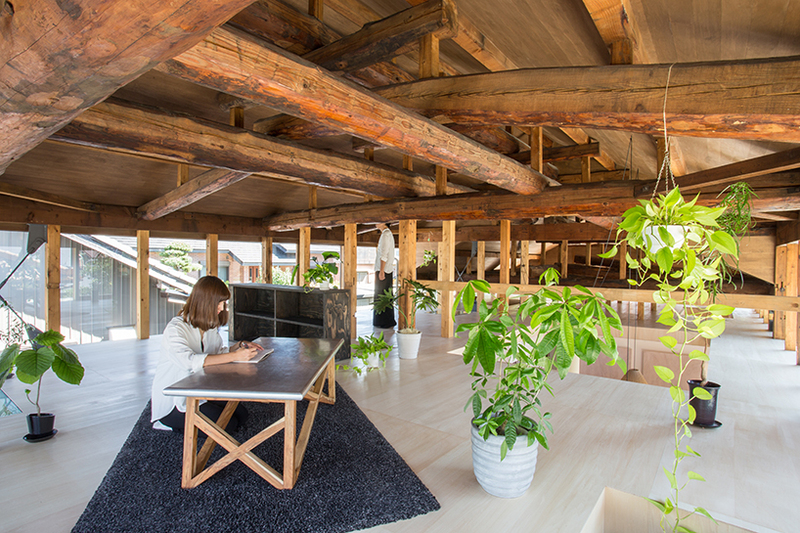 when the design team looked into the ceiling of existing house, there was a dark and large space spreading — a quiet existence of fine beams structure that we can not be seen recently in modern japan. compared to the living space on the first floor, the closed space with dark and large volumes above our head were unbalanced and strange. there are commercial and rapid development occurring around the site and the value of what has been there for many years. it is not a bad thing to change the landscape of the town, but we present one solution that resists the scrap and build of the town, not just leaving or updating with the maximization of esprit that was there for a long time. specifically, 1-1 architects regard the ceiling surface separating the first floor from the ceiling space as a ‘boundary’. take over the structure consisting of the first floor, the ceiling space and the boundary as the framework of this house and the designers think about creating a new relationship between the three for changing the way of making each. first, they make a new surface to insert new beams between the existing pillars for new boundary after partial disassembly leaving only the wooden frame of existing flat house. structurally, the japanese architects can shorten the length of the buckling length of the existing column and the wind pressure by creating a horizontal surface with this new boundary, and at the same time it’s the function of earthquake resistance reinforcement. 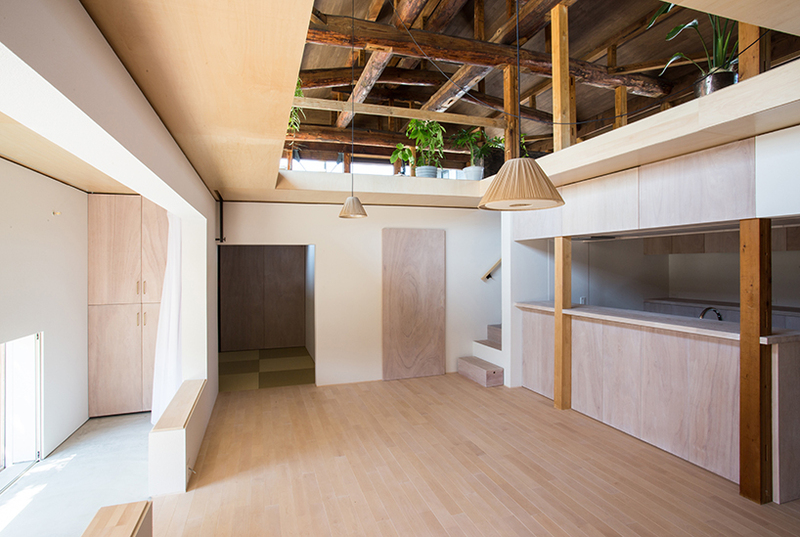 the ceiling space is created by the relationship between the boundary — floor — and the existing roof and beam structure. the later remains at the existing height, but due to the setting of a new boundary, it becomes a reachable hand, and it is felt like a partition and furniture. existing structural materials extend the meaning beyond mere roofs and beams. there were no walls in the ceiling space, and we planned a space group by the beam. there is no specific room there, it is possible to change flexibly to satisfy the requested floor area, expansion of living which can not fit on the first floor such as hobbies, invitations of friends and relatives, storage to extend the life that can not fit on the first floor. in addition, by making the walls all open with the height of the roof next house, delivering light and wind from the outside to the first floor while maintaining privacy. on the other hand, from the inside, by opening to the town with the height of the ceiling, the space that was closed in the past creates a moderate distance with the town. on the first floor, there are private rooms with privacy kept as requested by the client. each room set up walls to cover the existing pillars and satisfied the requested function. 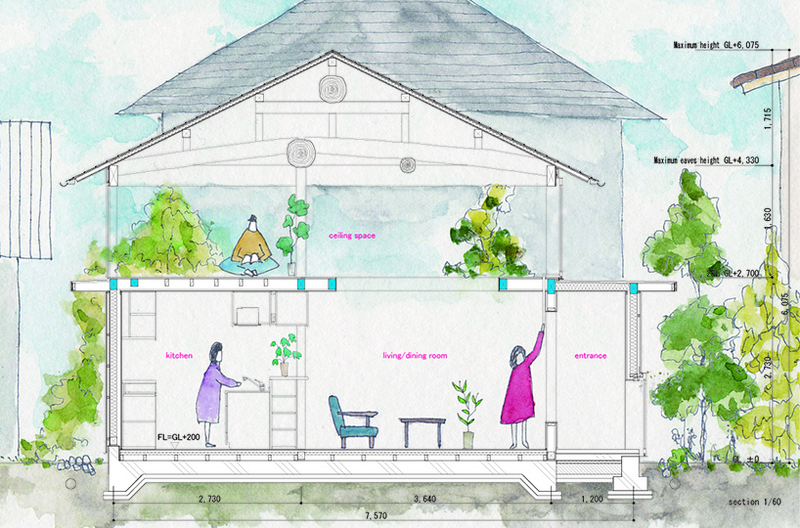 due to careful observation about connection of inside and outside, privacy, ventilation, daylight, openings of different sizes are planed on the boundary — ceiling — of each room, and the living environment of the first floor is compensated by them. in this project 1-1 architects have named ‘boundary’ which existed there as well as originally, but which was only recognized as the surface of the ceiling. by doing so, the project team tries to give the new meaning to the ceiling space hidden behind in the past. 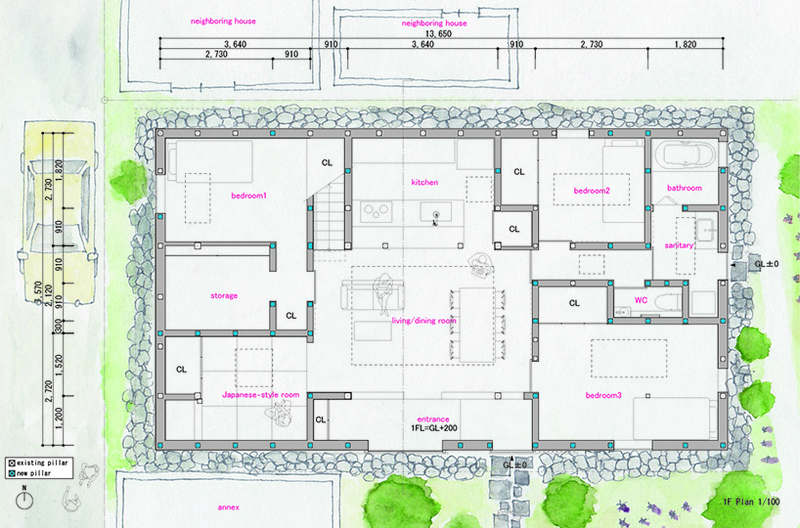 with the newly set boundary, the ceiling space and the rooms on the first floor are mutually compensated. 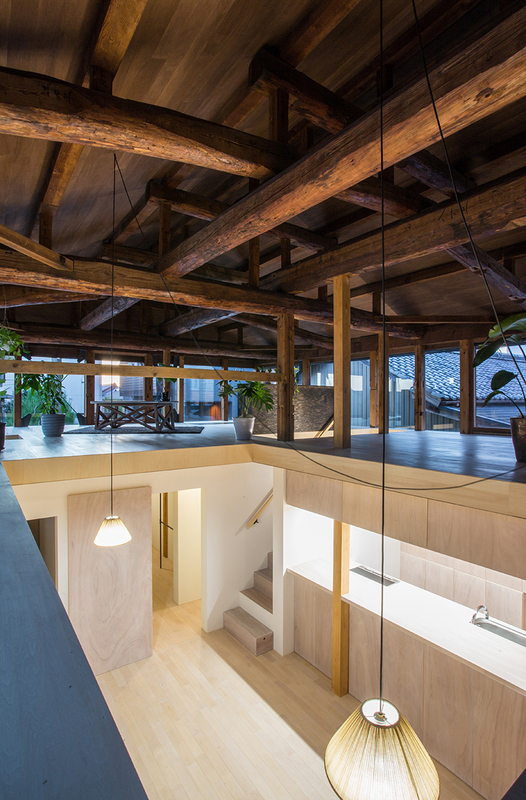 also, the ceiling space that appears in the town not only changes the interior of the house, but also changes the relationship which is not rapid to the streets.